Light Shining in Buckinghamshire begins with a feast. In the National Theatre’s new production, the safety curtain opens to reveal a vast table heaving with food. Overstuffed pies; plates spilling over with fruit; a whole, glistening pig. An obscene bounty. Around the edges, heedlessly stuffing their faces throughout the people’s battles and declarations, sit a shadowy host of figures in gowns. The poor scrabble while the rich gorge. It’s one hell of a metaphor – and one hell of a table, at that. Es Devlin’s raked design spreads greedily across the stage of the Lyttelton Theatre, occupying our entire field of vision. Above, a huge slanted mirror reflects back the candlelit opulence, while a gilt throne looms at the back of the stage. This is what the impoverished idealists and revolutionaries of Caryl Churchill’s Civil War play, dwarfed by the finery that surrounds them, have to contend with. Eschewing textbook Cavaliers and Roundheads for a focus on the radical far-left groupings of the Levellers, Diggers and Ranters, the sympathy of Churchill’s play lies with those dismantling the banquet. Her history is one of workers persuaded to fight by a fervent belief in the imminent arrival of Christ on earth; of radical thinkers and penniless hopers; of the heady possibilities of a nation without a monarch; and, finally, of those who would freely distribute rights to speech and land being crushed by those unwilling to relinquish their power. In this telling, it’s a war fought on heavenly promises for ultimately earthly spoils. That’s where, again, the central metaphor comes in. Bit by bit, the opening feast is stripped back to the earth from which it came, as Devlin’s set undergoes an extraordinary transformation. But while the people may till that newly uncovered soil, it soon returns to the hands of a small elite. As revealed by the Putney Debates of autumn 1647, slap-bang in the middle of the play, the Civil War quickly becomes a battle not for freedom but for land. For Oliver Cromwell and his allies, this is the sticking point; democracy is not to come at the price of their privileged property rights. Churchill’s is a play full of proclamations, of speeches grand and simple. We, the audience, are very deliberately addressed, positioned almost as witnesses. During the pivotal Putney Debates, the house lights are gently raised, daring us to speak up. Later, Steffan Rhodri’s butcher stares right out at us, refusing to sell us any more meat. We’ve had more than our fill. All that speaking, though, doesn’t always make for compelling drama. Lyndsey Turner’s production is a gorgeous thing to look at, with all the light, shade and careful composition of a series of paintings, yet like paintings the scenes too often feel static and poised. The rawness of anger and revolution has been given a pretty, polished sheen. There are some briefly breathtaking moments of theatricality – the voluminous tablecloth taking on a life of its own, or the wooden slats of the table being made to give way to the soil beneath – but for the most part it’s all talk and backdrop. There are obvious, though not forced, resonances. We live in a time that feels similarly on the brink of an apocalypse – though one heralded by climate change rather than Christ – and we’re approaching the most genuinely unpredictable general election in decades. Again, we face both possibility and despair. And seeing the show on St George’s Day, the nationalist rhetoric tugs on the ear, speaking of all the ways in which pride for one’s country has been – and continues to be – used to mobilise people. But “for England” (or Britain) only ever really means for a select few. In a subtle touch, Soutra Gilmour’s costumes suggest that the distance of rulers from ruled is temporal as well as economic. While the aristocratic chorus are got up in period gowns, the non-specifically scruffy Diggers, Levellers and Ranters could have been plucked out of various points in history – right up to the present day. One would-be revolutionary even pulls out a thermos. This has been going on for hundreds of years, Turner’s production seems to be saying, and those at the top still have yet to change. This plays out on an epic scale, with the already large cast (Leo Bill, Joshua James, Trystan Gravelle and Adelle Leonce all stand out from the considerable crowd) supplemented by a community company of more than 40. There are an awful lot of bodies on stage. 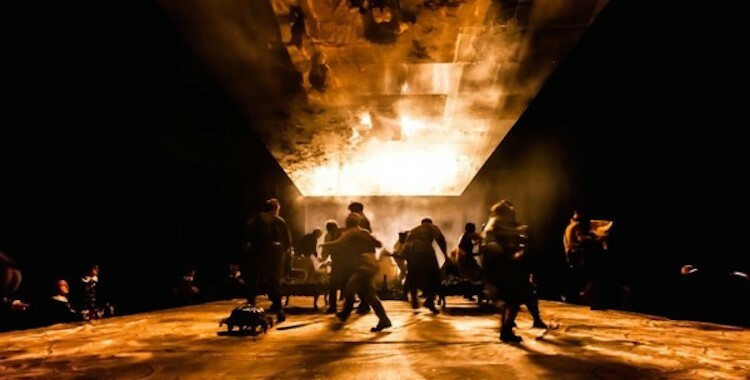 This is less the fragmented experience of war suggested by the play’s many small scenes and vignettes and more of a mass event, with a crowd of other players always lurking in the background. While this breadth can give a powerful sense of “the people”, however, the sheer size and ambition of the production – like the lavish spread it opens with – all feels a bit much. It’s a plea for the earth coming from the heart of the feast.